This guide examines key features of the California Earned Income Tax Credit and the Governor's plans to expand the credit. According to the Supplemental Poverty Measure — a more accurate indicator of economic hardship — more than 7 million Californians live in poverty. 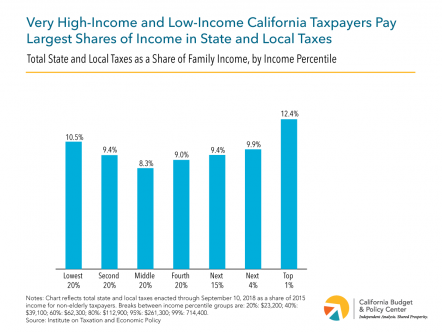 This blog post highlights tax policy choices that California has made in recent years to make its tax system fairer and discusses several options, near-term and far-term, for our state to raise revenues and reduce income inequality. This Data Hit shows that in California’s working families, poverty is more prevalent among children of immigrants and highlights that policymakers can help more children reach their potential by making policies inclusive. This blog post discusses the social determinants of health, which show that health outcomes are dependent on a wide variety of factors beyond access to health care, and highlights three priorities in the 2019-20 state budget proposal that would advance health equity. Data Hits: California’s immigrants and undocumented immigrants make significant contributions to the state economy. Fact Sheets: The unmet need for subsidized child care in California across age and race and ethnicity.